Dallas Zoo helps plant a record-setting 11,000 trees | Dallas ZooHoo! 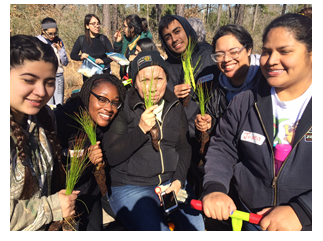 Our Dallas Zoo Wild Earth Action Team led 65 volunteers last Saturday to help reforest a 300-acre tract in Big Thicket National Preserve. The area was heavily impacted by hurricanes and past logging. According to the National Park Service, we set an all-time record by planting 11,000 longleaf pines in the Preserve in one day. 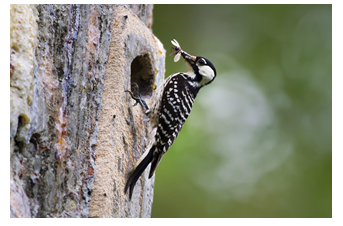 Dallas Zoo delivered this action for animals on behalf of the endangered red-cockaded woodpecker and in honor of the centennial anniversary – 100 years – of the National Parks Service. It’s a long-term investment as our trees will be ready for the red-cockaded woodpecker (and bi-centennial celebration) when they mature in about 80 years. Tell your grandkids to visit! The red-cockaded woodpecker is a small bird without brilliant plumage or spectacular displays, but with a social system as complex as any North American animal, more like a primate than a bird. For their cavity homes, they need old, living pine trees, which are pretty rare today. 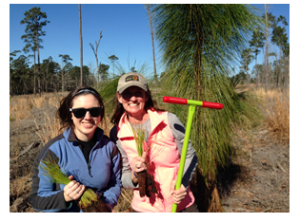 Over 90 million acres of longleaf pine forest once stretched across the American south. But beginning in 1940, vast areas of public and private land were converted to short-rotation forestry and now less than 10,000 acres of old-growth longleaf pine remain today. No strategy to save animals is complete without a focus on habitat loss and the work to restore it. Saving animals from extinction is not only a battle, but also a movement made up of scores of passionate and dedicated people caring and working together. At Dallas Zoo, we care for animals and we know our members, guests, and volunteers do, too. Every forest protected, every waterway restored, every endangered species saved begins with us. Our Dallas Zoo network, working and caring together, will change the world for wildlife.